The American Optometric Association recommends a complete optical examination every 1-2 years, depending on your age, eye health and occupation. A thorough examination includes an assessment of visual health, overall eye health, and can even detect systemic conditions such as diabetes, high blood pressure, high cholesterol and neurological disorders. 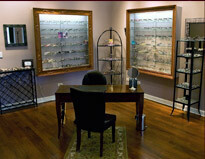 When vision correction is required, options include glasses, contacts and laser vision correction. Your Urban Eyecare physician can help you choose the right option for you, and offer a range of services such as follow-up exams, pre- and post-op care, and frame and lens consultation.